With the internet growing at a very fast pace, we have come across a time when there are new and better business opportunities being created every other day. One such strategy you must have heard about is Affiliate marketing. For those of you who are not yet aware of this, Affiliate Marketing is a type of marketing which is performance based and in this kind of marketing, a business rewards one or more of its affiliates who bring in customers in the form of traffic through their own affiliate links onto the site of the business owner. For each visitor that an affiliate brings in through his/ her marketing tactics, the business is supposed to pay them a particular amount of money. CPA stands for Cost Per Action and it is a type of marketing in which you get paid every time someone clicks on your affiliate link in order to complete any action on the business’s website. Over time, CPA has become a primary source of income for publishers since there are very little efforts required and in turn, you can make great profits as well. Let us take a look at one of the prominent affiliate programs in the world, admitad. What is admitad CPA Affiliate Program? admitad is a well- known network of Cost Per Action (CPA) based affiliate programs that is known for providing its services all across the globe. Basically, admitad offers all advertisers with a trustable and robust source of sale. Not only this, it is also known for offering publishers with new and advanced business models which will bring in more traffic towards their website over time along with better monetization options as well. At admitad, they strive towards offering a crystal clear ROI to their clients, who by the way are also serving more than 1300 recognized international brands as well as more than 540,000 accomplished publishers from across the globe. Let us take a look at how admitad came into existence. Back in 2010, admitad was established in Germany with its headquarters situated in Heilbronn. Currently, there are several offices of admitad situated in different parts of the world. Over time, this vast spreading network has successfully leveraged its size and scale to attain exclusive deals and partnerships with some of the recognized brands and establishments from all over the world. Most recently, admitad is also in the news for collaborating with some of the giants, such as Booking.com, Target Microsoft, Adidas, Nike, eBay, and Citibank. However, its most effluent deal has to be none other than Aliexpress! Now that we are well acquainted with the concept of Affiliate Marketing and CPA, let us take a look at some of the benefits of joining admitad. It is very easy to sign up on admitad and all the required options and choices are arranged in an easily accessible manner for users to navigate as well as use during all times. Since there are no gigantic technical terms used, it is not at all intimidating for beginners as well. admitad brings all publishers and advertisers under the same roof, hence providing them with a stream of opportunities to enter and do business in the global markets. This way they get ample opportunities to increase their revenues while also optimizing their marketing strategies over time. 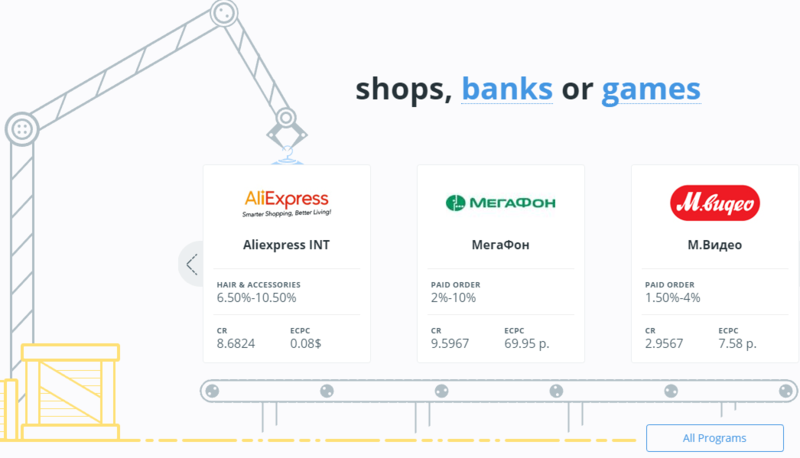 This can be achieved with the help of several high-end optimization tools which are handled and maintained using an anti-fraud analytic system. While majority of the affiliate marketing networks out there opt for a monthly payment schedule, admitad offers a more convenient weekly payment pattern. There are also several different modes of payments available to select from, including Wire Transfers, PayPal, and other online payment options. However, there is a payment threshold that is fixed for all weekly payments and it is currently fixed at $10 in any currency. admitad is known for acquiring tie-ups with a plethora of different services as well as products. This has been done keeping in mind the fact that clients will have more matching advertisements to publish across their websites. Some of the categories under which admitad regularly conducts campaigns includes mobile phones, online games, ecommerce websites/ services, coupon services, food delivery, travel, finance, and so on. It is a very well-known fact that all affiliate marketing strategies are driven by facts and statistics. This is the reason why admitad focuses on releasing detailed, well-researched, and logical reports. If you are currently associated with admitad or wish to do so after going through this review, you can also add the SubID tracking facility to your links in order to analyze the clicks, actions, and impressions in a better manner, that too along with additional details and information. You can also export all admitad reports to XLS and XMS so that they can be accessed from external software as well. There is also the admitad API or the Postback URL tool using which you can feed the data in the report onto your system directly. admitad offers specifically-designed tools for publishers and advertisers using which they can improve the performance of their programs along with increasing the conversion rates. There are metrics, charts, tables, graphs, and dashboards, etc. to help all the customers with their reports and data analytics. There is good news for all advertisers and publishers associated with admitad. 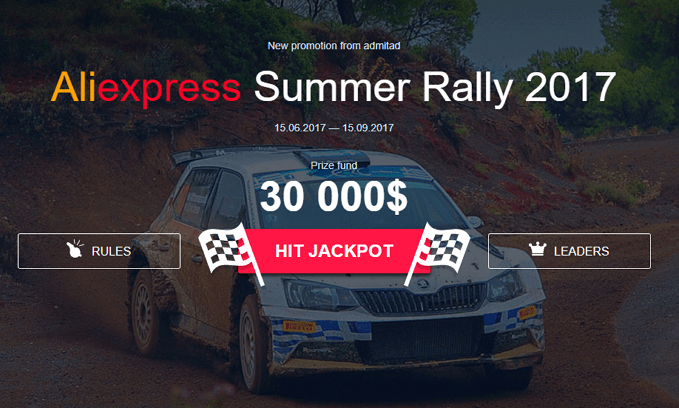 They can now take part in the much-awaited Aliexpress Hot Summer Rally 2017. There is a whooping jackpot being offered, $30000 to be exact!! This rally has already begun on July 15, 2017 and it is scheduled to conclude on September 15, 2017. Corresponding to each month, there are three stages of races scheduled to take place. With the CPA network like admitad bringing in such a golden opportunity for the global publishers and advertisers. Even, it is the high time for everyone to get on board with this Aliexpress Hot Summer Rally 2017 in order to get their hands on a big jackpot. So, if you yet not started with CPA marketing or looking for some best network to work effectively. I can suggest admitad as a great option which seems good with their awesome support and regular offer. You can signup for admitad and get started with your affiliate marketing career. Till then I look forward to your views on the comment section below. Hit like and let your friends know about this jackpot offer and rally by sharing our post. Is 2018 the Year When Ether Will Finally Overtake Bitcoin?